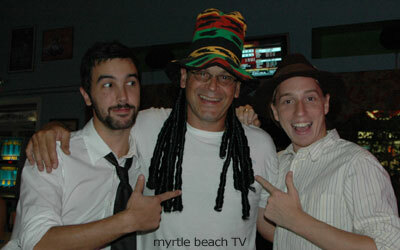 Would you like to be on one or more episodes of the myrtle beach TV show? There's a few ways you can, and we encourage anyone interested to contact us. We have a LOT of fun shooting all around the Grand Strand each week, and we enjoy having lots of locals on the show. 1 You can suggest a facet of local life we're not currently covering in a regular segment (i.e., politics) and become the host. 2 If you are part of an organization or know of an organization that helps people or animals in need, we'd love to have you on the show. 3 If you have a story to tell, or know of an interesting business or event happening, let us know and perhaps we'll shoot a behind-the-scenes about it. 4 Or, if you'd just like to be part of the background cast in an episode, you can watch our calendar for where we'll be shooting on location, and join us for any open-set shoots. As new episodes will be produced weekly for over a year, we are always looking for more contributors to the show. If interested, decide how you may be an addition to the show, contact us telling us how you'd like to contribute. If you'd just like to talk with us or be an extra in any of the upcoming shows, then visit myrtle beach TV's myspace page for our on location shooting schedule.